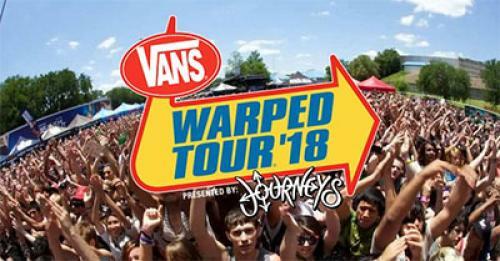 May 15, 2018 - As the Vans Warped Tour prepares to embark on its final cross-country trek, Target is offering an exclusive package of the 2018 Warped Tour Compilation, featuring songs from bands on the tour this year including: Tonight Alive, Waterparks, Senses Fail, Picturesque, Broadside, Simple Plan, and more. The compilation will be released on June 22, 2018. Tonight Alive's Jenna McDougall is featured on the cover. The Australian rock band will perform at every date this summer. "Warped Tour has been a life changing experience for Tonight Alive over the years," Jenna said. "For us it was an amazing incubator as artists and gave us the unique opportunity to transform daily in front of an audience. I start and finish the tour as a different person every time and feel so honored to be pictured on the final years compilation CD! I can't wait to make my final mark with the festival this Summer." 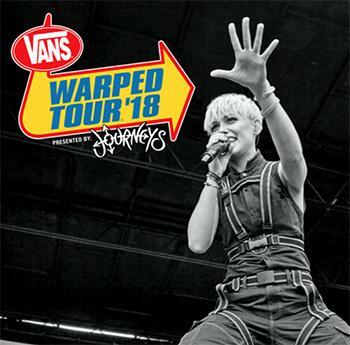 Photographer Lisa Johnson has spent years photographing Warped Tour and captured the photo of Jenna featured on the final compilation. "It has been a honor to collaborate with SideOneDummy creating the packaging for the annual Vans Warped Tour Compilation CD series for nearly two decades. Purchasing the compilation CD release is a rite of passage for any Warped concert go-er, and a wonderful time-capsuled soundtrack to the summer," Lisa said. "We put a lot of thought and care into each image that appears on the two discs and in the packaging. Hopefully anyone who has ever picked up the CD has enjoyed feasting their eyes on the artwork while reliving their Warped experience in every panel." The compilation will also be available at the SideOneDummy tent at every date of the Vans Warped Tour. 1. Tonight Alive - "Book of Love"
2. Senses Fail - "New Jersey Takes, The World Makes"
3. Real Friends - "Get By"
4. Knuckle Puck - "Double Helix"
5. State Champs - "Slow burn"
6. Sleep On It - "Distant"
7. Story Untold - "All the Same (Once a Liar Always a Liar)"
8. Mayday Parade - "Jamie All Over"
9. This Wild Life - "Headfirst"
10. The Maine - "Black Butterflies and Déjà Vu"
11. Palaye Royale - "Get Higher"
12. Doll Skin - "Baby's Breath"
13. Don Broco - "Stay Ignorant"
14. Picturesque - "New Face"
15. Simple Plan - "Boom!" 16. The Interrupters - "She Got Arrested"
17. Shiragirl - "Get Em Hot"
18. Less Than Jake - "Things Change"
20. Assuming We Survive - "California Stoned"
22. With Confidence - "Keeper"
23. Summer Wars - "End of an Era"
24. Grayscale - "Let It Rain"
25. As It Is - "Austen"
26. Four Year Strong - "For Our Fathers"
1. Ice Nine Kills - "Nature of the Beast"
2. August Burns Red - "King of Sorrow"
3. Motionless in White - "Voices"
4. Asking Alexandria - "Where Did It Go?" 6. Every Time I Die - "Glitches"
7. Wage War - "Stitch"
8. Knocked Loose - "My Heroes"
9. Chelsea Grin - "Four Horsemen"
10. In Hearts Wake - "Passage"
12. Twiztid - "Nothing to You"
13. Kublai Khan - "Split"
14. Phineas - "I Saw The Bombs Fall"
15. Dayseeker - "Cold, Dark Winter"
17. Crown The Empire - "Zero"
18. Trash Boat - "How Selfish I Seem"
19. Dead Girls Academy - "I'll Find A Way"
20. Farewell Winters - "On A Light Note"
21. Capstan - "The Wreath and The Follower"
22. The Amity Affliction - "This Could Be Heartbreak"
23. Movements - "Full Circle"
24. Hail the Sun - "Suffocating Syndrome"
25. Waterparks - "Lucky People"
The Vans Warped Tour, presented by Journeys, is well known as America's longest running touring music festival of the summer. Since 1995, the tour has been a showcase for both established and up and coming talent, across a wide range of eclectic sub-genres. Alternative Press readers voted the Vans Warped Tour as the "Best Tour/Festival" and Rolling Stone called it "America's Most Successful Festival"